High quality polygonal 3D model of Ferrari Enzo. Highly detailed exterior and semi detailed interior. 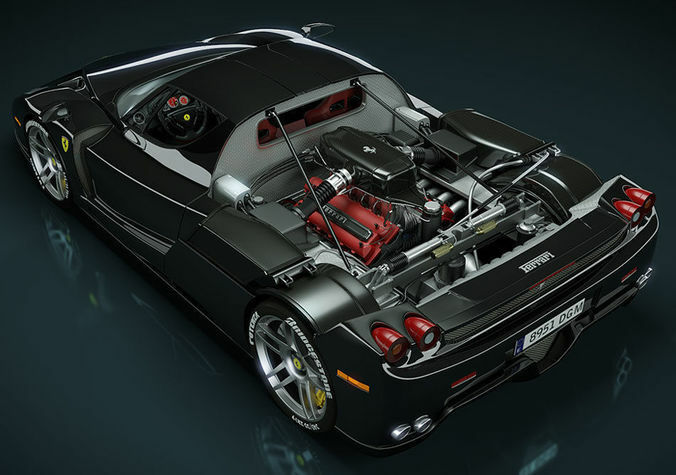 The Enzo Ferrari is a 12 cylinder mid-engine sports car named after the company's founder, Enzo Ferrari. It was built in 2002 using Formula One technology, such as a carbon-fibre body, F1-style electrohydraulic shift transmission, and carbon fibre-reinforced silicon carbide (C/SiC) ceramic composite disc brakes. Also used are technologies not allowed in F1 such as active aerodynamics and traction control. The Enzo Ferrari generates incredible amounts of downforce which is achieved by the front underbody flaps, the small adjustable rear spoiler and the rear diffuser working in conjunction, 3363 N (756 lbf) is generated at 124 mph (200 km/h) 7602 N (1709 lbf) is attained at 186 mph (299 km/h) before decreasing to 5738 N (1290 lbf) at top speed. A thing of beauty! The detail is awesome.